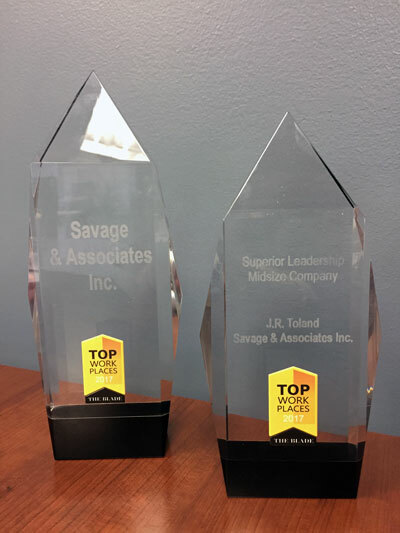 For the third consecutive year, The Blade has ranked Savage and Associates among the Top Workplaces in the Toledo region. 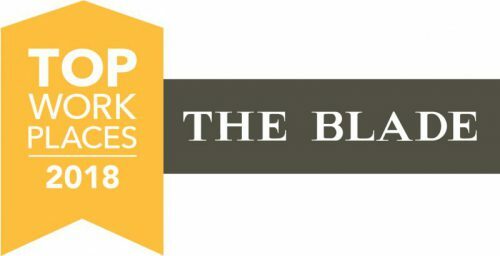 In 2019, The Blade recognized 45 companies and organizations for the annual honor based on feedback collected from thousands of area employees. Toledo area public, private, nonprofit, and government organizations that employ 35 or more people are eligible to take part in the Top Workplaces contest. Savage has been recognized in each year it has participated. As in past years, The Blade partnered with Energage Media Partnerships to conduct the workplace poll. Workers for nominated employers were invited to complete a 24-question survey about their companies. Learn more about what being one of Toledo’s Top Workplaces means to us by watching this video. Third-party rankings and recognition are no guarantee of future investment success and do not ensure that a client—or a prospective client—will experience a higher level of performance or results. The rankings mentioned on this web page should not be construed as an endorsement of the advisor by any client, nor are they representative of any one client evaluation. 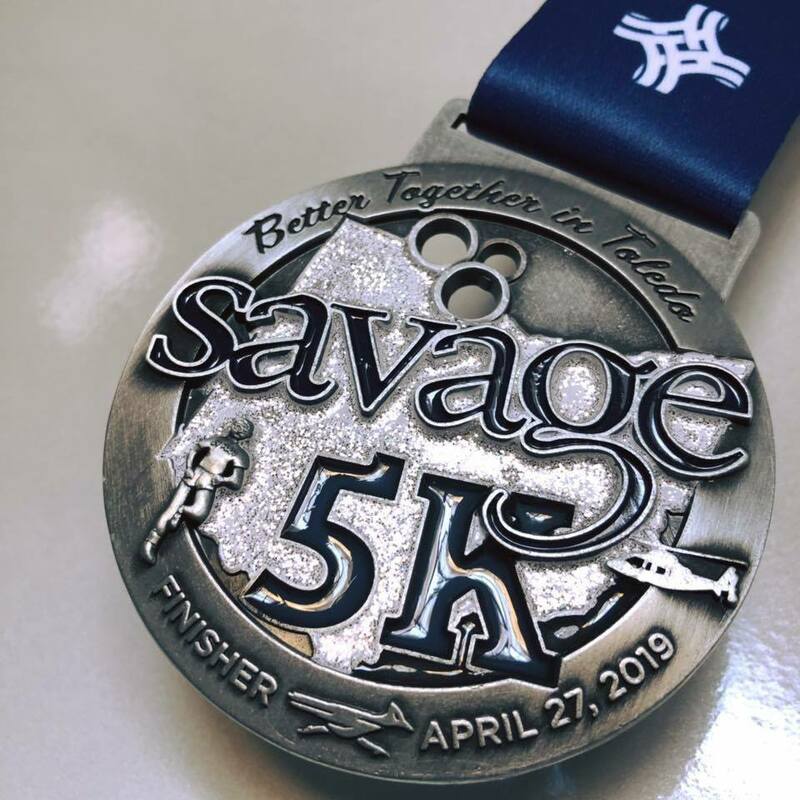 Savage and Associates is proud to sponsor the Savage 5K on Saturday, April 27, 2019, at 9:00 a.m. The event, part of the Mercy Health Glass City Marathon weekend, is open to runners and walkers of all ages and abilities. Starting and ending on the University of Toledo campus, Savage 5K participants pass such UT landmarks as the Glass Bowl, Student Recreation Center, and Greek Village before crossing the finish line inside the Glass Bowl stadium. 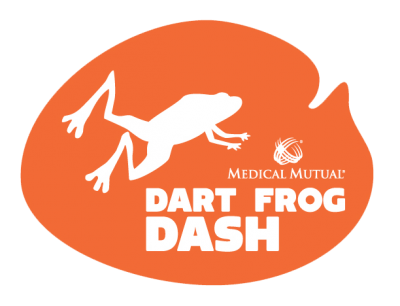 Finishers receive a medal and a commemorative glass mug, and enjoy a post-race party featuring hot food, cold beer, refreshments, massages, and more. Registration fee is $35 ($40 after March 31). An optional T-shirt is available for $7. Race proceeds help support area nonprofit organizations. To register for the Savage 5K, click here. Open enrollment for the Affordable Care Act is right around the corner. Savage and Associates advisors can answer your healthcare questions. Open Enrollment for 2019 coverage runs between November 1, 2018 and December 15, 2018. You must apply by December 15 to ensure an effective date of January 1, 2019. A Savage & Associates advisor can help choose the plan that works best for you and your unique set of financial circumstances. 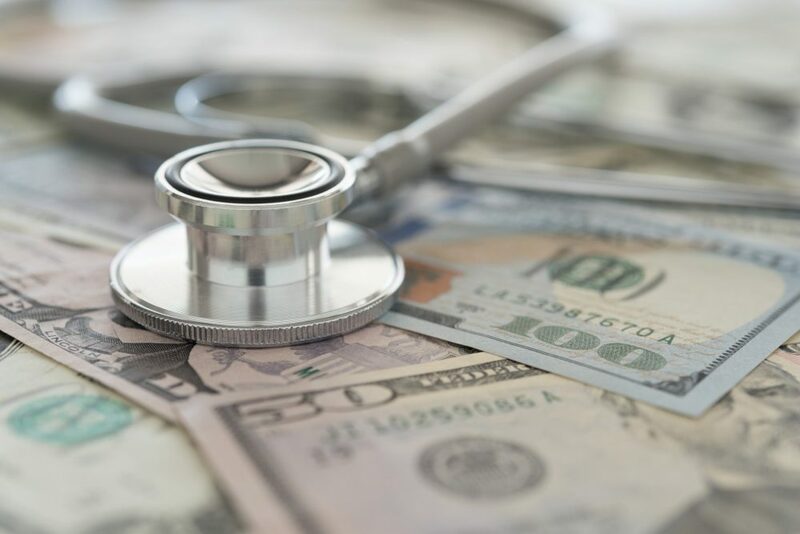 “While it may be tempting to choose the lowest priced plan, it’s important to consider if you can afford the deductible that comes with it,” says Savage & Associates advisor Dan Finkel. Before you make a decision, speak with a Savage & Associates Advisor. We will work with you to ensure that you and your family have a plan that makes sense for you. Talk to a Savage & Associates Advisor today and get covered. For the second year in a row, The Blade has ranked Savage & Associates among the Top Workplaces in the Toledo region. And this year, Savage topped the list of midsize companies—those employing 75-299 people. The honors are part of The Blade’s annual Top Workplace survey, which collects feedback from thousands of area employees. This is the fifth year The Blade has partnered with Energage—a Philadelphia-based employee research and consulting firm—to conduct the workplace survey. Seventy-two Toledo-area companies participated in the competition, each having a requisite 35 or more employees. In all, more than 7,400 respondents scored their employers on factors ranging from leadership to employee engagement. 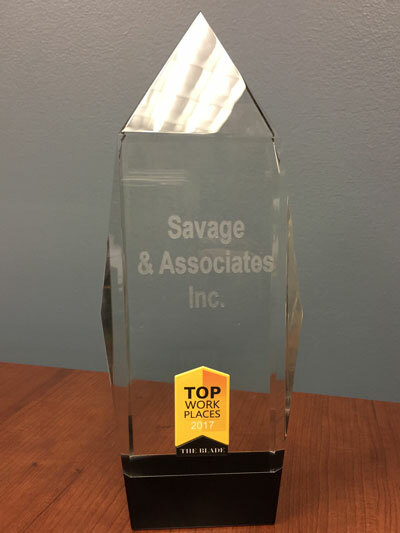 Savage & Associates has participated in the survey twice, making the Top Workplaces list both times. In their anonymous survey comments, Savage & Associates employees conveyed similar beliefs about the firm’s culture. Respondents expressed appreciation for leaders who make them feel cared for and valued, and who genuinely model Savage’s vision and values. Preserving John Savage’s legacy culture while also inspiring young employees who never met him presents a bit of a challenge. But throughout the years, says Toland, Savage has never deviated from its basic business philosophy. Few individuals impact philanthropic efforts in Northwest Ohio as greatly as Robert and Susan Savage, who work tirelessly to make our community a better place. In recognition of their generosity, Bob and Sue Savage are 2017 recipients of the Outstanding Philanthropists Award presented by the Northwest Ohio Chapter of the Association of Fundraising Professionals (AFP). Bob and Sue contribute their time and treasure to countless area organizations, including the University of Toledo, Imagination Station, Toledo Lucas County Public Library, and Toledo-area Christ Child Society—just to name a few. Bob and Sue will be recognized at AFP’s 30th Annual National Philanthropy Day luncheon on November 9. The event will be held from 11 a.m. to 1:30 p.m. at Premier Banquet Hall in Toledo. Rain can’t stop Savage and Associates’ staff, business associates, and area public officials from kicking off new headquarters construction. 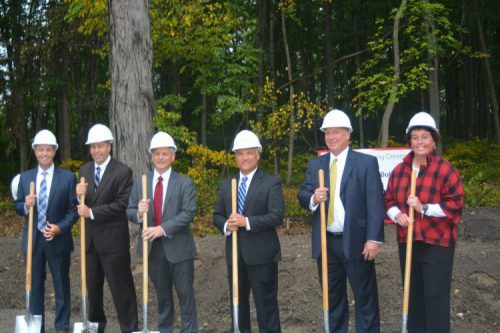 From left to right: Mark Smigelski, Joel Tschantz, J.R. Toland, Russ Karban, Scott Walsh, and Kelly Savage break ground for the new headquarters. Savage and Associates held a groundbreaking ceremony for its new headquarters on Tuesday, September 19th. Savage advisors, employees, representatives from NAI Harmon Group, local politicians, and the news media gathered on the site of the future headquarters. Government and business leaders spoke about the new building and why Savage and Associates’ continued presence in the community is so important to northwest Ohio. U.S. Representative Bob Latta joined in to express that having successful businesses like Savage in the area is vital to the continued resurgence of the region. Maumee Mayor Rich Carr added that Savage’s commitment to the community over its 60-year history is what sets the business apart. He noted the Savage Foundation and the more than $1 million it has raised for charity in the community. Ed Harmon, CEO NAI Harmon Group, spoke about how the partnership between NAI Harmon Group and Savage allowed the project to happen. J.R. Toland, President and CEO of Savage and Associates, wrapped up the festivities by speaking about the success of Savage and how the new building will allow our clients to continue to receive unparalleled service. The new headquarters will be located between US 23 North and Arrowhead Road, just south of West Dussel Drive. Savage’s 55 advisors and 45 employees are expected to move into the new building in Fall 2018. Follow along on Facebook and SavageAndAssociates.com for construction updates in the coming months! Parents cannot delegate financial lessons for our children to anyone else. Teach your children the importance of saving and investing for the future before poor habits are formed. I was fortunate to learn from my parents the discipline of saving money at a young age which put me on the path to make financial advising my profession. My wife Carolyn and I have six children ages 2-22. 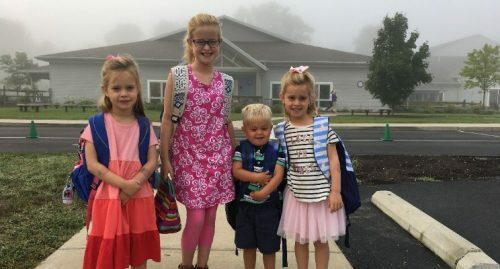 The following are a few simple ways I teach financial responsibility to our three young daughters (age 6, 6, & 9). Lead by Example – If you want your child to be a good saver, be a good saver yourself. Kids will model the behaviors they observe at home. Talk to your children about the importance of saving money for the future. This does not mean saving for a specific purpose, but saving with the idea of accumulating funds to invest. Keep it Simple – The most important financial concept for a child under the age of 10 to learn is the importance of saving money. It’s something you can teach before they learn how to read. As your children earn money through chores, achievement, and gifts, encourage them save in their piggy bank and, ultimately, the real bank. Enthusiastically celebrate their savings success so they feel good about their behavior. Bank Accounts – Each child should have a bank account by the time they are 5 years old. We make a big deal out of organizing their money and taking it to the bank for deposit. About every 2 months, I load the kids in the car for a Saturday morning trip to the bank. Each of them goes to the counter to deposit their money, get an update on their account balance and, of course, pick out a sucker. A small percent of the money is held back and used to pick out a toy as an immediate reward for saving. Drop a Hint about Investing – I introduce simple ideas about investing and why it is important to eventually transition money from the bank to investments. Understanding investing in terms of owning part of a company and getting paid when people buy things from that company is as complex as you should be at this age. Planting the seeds of financial discipline at a very young age is good parenting. The education must continue as your child becomes older and the message needs to change at each age bracket. This family-friendly event has something for everyone. For the runner, this is a 5k competitive race on a USTAF certified course but is also open to those who just want to walk the route. There is also a kids Fun Run for children ages 0-12. Our Savage family will be there in force. Information for sign up can be found here. We invite everyone to register and enjoy your Zoo on race day. 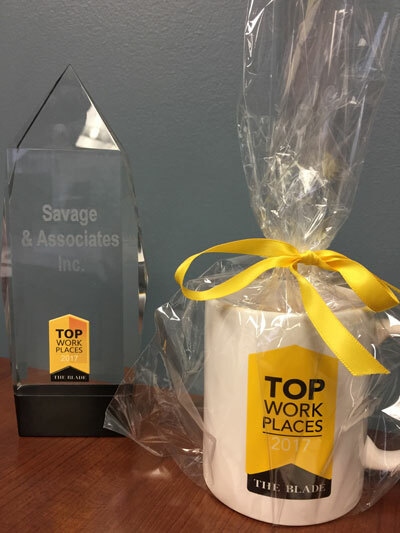 Savage & Associates is proud to be honored by the Toledo Blade as one of the Top Workplaces for 2017 in Toledo. 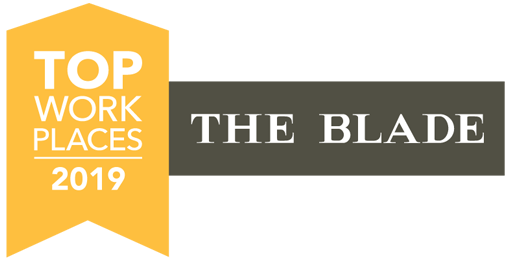 The announcement came at the Toledo Blade Top Workplace Award dinner, at the Toledo Club, on January 26, 2017. This is the first year Savage & Associates participated in the four years the awards have been given by The Blade. Top companies were determined from employee surveys completed by 5,732 participants. The results were overseen by Philadelphia-based WorkplaceDynamics, an employee research and consulting firm. 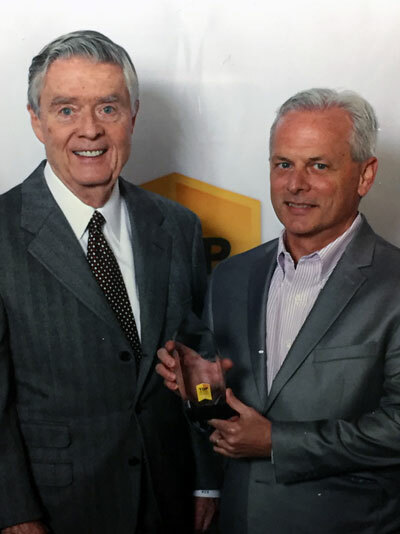 In addition to winning in the Top Workplace for Mid Size Companies category, CEO, JR Toland was also named the top company leader in all of Northwestern Ohio. St. Francis High School in Toledo, OH has a tradition of celebrating athletes and service-oriented successes. 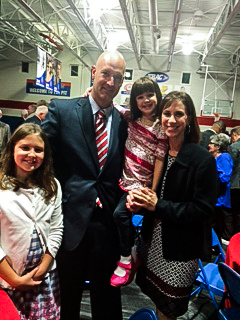 On October 27, 2016, Savage & Associates advisor, Damian Ogrodowski was selected to be inducted into the school’s Hall of Fame. 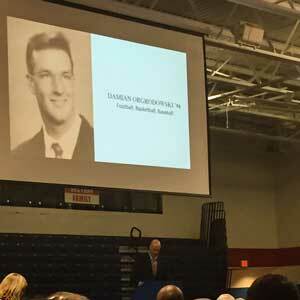 Inductees are chosen from former athletes who demonstrate leadership and serve as role models for students. They are nominated by alumni and friends of St. Francis. Damian was chosen for his service, athletic excellence, and community involvement. Damian’s daughter Lily was the highlight of the evening, giving an incredible introduction speech for her Dad. 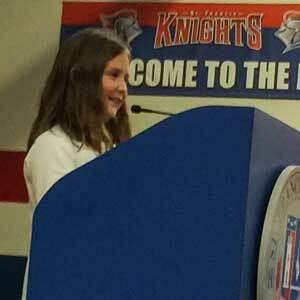 Her clear and composed words impressed the crowd of 350. Among Damian’s accomplishments as an athlete, he is tied for #1 spot all time for total varsity letters at St. Francis. He was a standout student athlete and represented Savage and Associates extremely well. Savage & Associates sponsored a table for the event and several associates attended along with President and CEO, JR Toland.